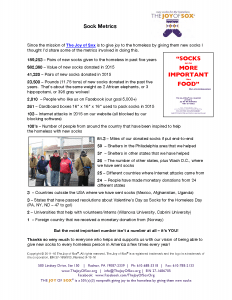 A handout FAQ answering questions about new socks for the homeless. The Joy of Sox is a nonprofit that provides joy to the homeless with new socks. Dangers to the Homeless Without Socks. 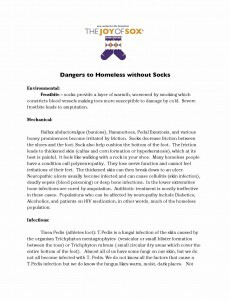 This handout, written by a board certified Podiatrist, talks about the dangers to the homeless without socks. 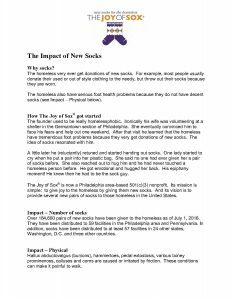 The Joy of Sox is a nonprofit with the mission of providing joy to the homeless by giving them new socks. In this article Susan Papp-Mlodzienski, DPM FACFAS explains the dangers to the homeless without socks. Dangers to the Homeless Without Socks . A video of Dr. Papp-Mlodzienski explaining the dangers can be found on our YouTube Channel. The Impact of New Socks. 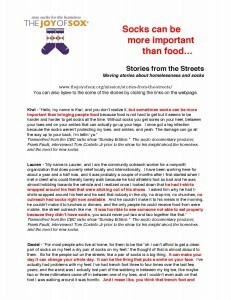 Since “Socks can be more important than food” is a very important part of our message we’ve included two link about it. One is our page Stories From The Streets where we tell some of the … stories form the streets. 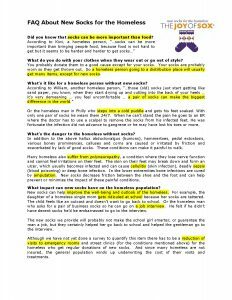 The other is this powerful handout which contains several moving quotes from the homeless community in Toronto, Canada. Socks Can Be More Important Than Food. This handout explains how to conduct a sock drive. Interesting Metrics about The Joy of Sox. The Joy of Sox is a nonprofit that gives joy to the homeless by giving them new socks. This handout is an interesting collection of some of the metrics of The Joy of Sox. For example, did you know that if you weight that amount of socks that were donated it would be about 23,500 pounds – or 11.75 tons. That’s about the same weight a 2 African Elephants, or 3 Hippopotami, or 395 Gray Wolves! 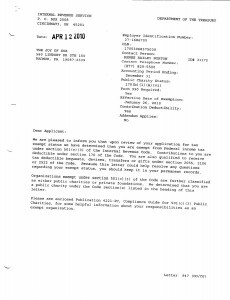 The 501(c)(3) determination letter from the IRS for The Joy of Sox, a nonprofit that provides joy to the homeless with new socks. 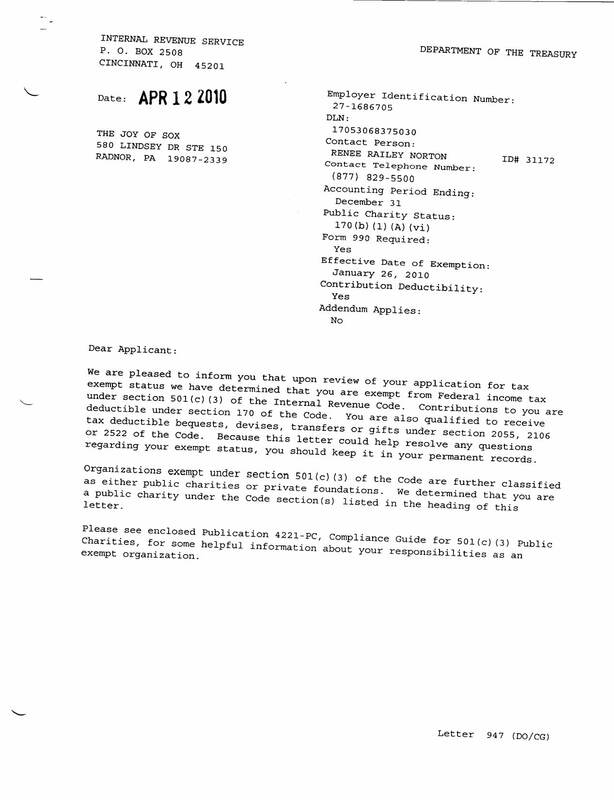 Here is a copy of our 501(c)(3) determination letter form the IRS. This is the document that says we are a nonprofit. If you are asking for donations (socks or funds) and someone wants to see our determination letter please feel free to print it out and share with them. 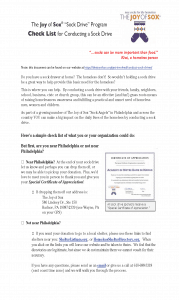 The Joy of Sox’s 501(c)(3) determination letter. North Dakota Proclamation recognizing The Joy of Sox for their work providing new socks for the homeless. New York, Pennsylvania and North Dakota have recognized the importance of new socks for the homeless and the recognizes the impact that The Joy of Sox® plays in that mission by issuing either a state proclamation or resolution. In North Dakota Governor Jack Dalrymple signed a Proclamation. In New York a Legislative Resolution was signed and sent to Governor Andrew Cuomo. In Pennsylvania a state Senate Resolution was passed. Coming soon: New Jersey, Delaware, California and Wisconsin. 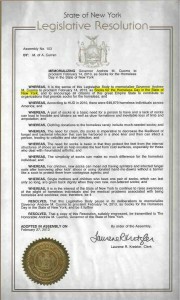 New York Legislative Resolution recognizing The Joy of Sox for their work providing new socks for the homeless. 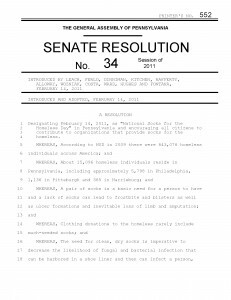 Pennsylvania Senate Resolution recognizing The Joy of Sox for their work providing new socks for the homeless.